"I have had many people try this and couldn't believe how moist and delicious it was for gluten free." Beat white sugar and vegetable oil together in a bowl using an electric mixer until smooth and creamy; beat in eggs, 1 at a time, mixing well after each addition. Add 1/2 teaspoon vanilla extract and mix. Combine baking flour, baking powder, baking soda, cinnamon, and salt in a separate bowl; mix into sugar-vegetable oil until batter is smooth. Fold carrots into the batter; pour into the prepared baking pan. Bake in the preheated oven until a toothpick inserted in the center comes out clean, about 35 minutes. Allow cake to cool completely, at least 30 minutes. Beat cream cheese and butter together in a bowl using an electric mixer; beat in confectioners' sugar, a little at a time, until icing is smooth and creamy. Add 1 teaspoon vanilla extract and beat well. Spread icing onto cake. 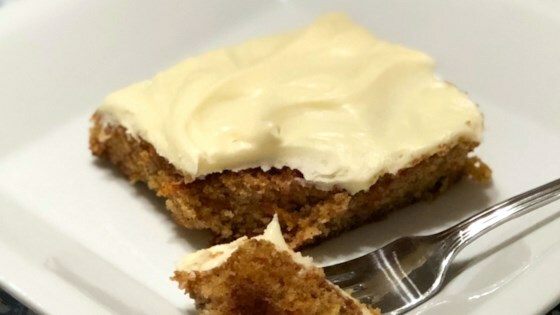 See how to make a simple, moist, and yummy carrot cake. Excellent! Family raved about it! Added dark raisins and that's all! Would make again! No changes and everyone liked it, didn’t think it was gluten free ? ?